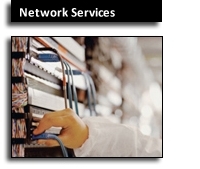 Our friendly, professional, highly experienced technicians are ready to make your network the high-performance, reliable backbone of your business operations that it should be. Our pledge to you is that we will install what you need (and only what you need) for a reliable, responsive network. HOURLY RATE: Any or all of these services may be purchased at an hourly rate of $120 per hour, calculated to the minute. Travel time is charged at $60 per hour, and is also calculated to the minute. The initial consultation - a discussion of how we may be of service to you - is provided free of charge. (713) 721-3126 or send us a message.